Tag line: "A feast for the imagination"
Fairy tales, by their very nature, weave together elements of fantasy and reality in an effort to teach us something about the human condition. Director Matteo Garrone does just this with 2015’s Tale of Tales, giving us a live-action fairy tale that is, all at once, vibrant, frightening, funny, enlightening and romantic. Set in a mythical world, Tale of Tales presents three separate stories, each focusing on a different kingdom. Unsuccessful in her attempts to bear a child, The Queen of Longtrellis (Salma Hayek) consults an oracle, who tells her that, to become pregnant, she must eat the heart of a sea monster that has been cooked by a virgin. To please his wife, the King (John C. Reilly) battles and kills an underwater serpent, only to die himself in the process. Still, even in tragedy, the Queen’s resolve to be a mother remains strong, and, following the oracle’s advice, she orders the only virgin in her kitchen to prepare the beast’s heart. Once she devours it, the Queen does, indeed, give birth to a young boy who she names Elias. In an amazing turn of events, the virgin who cooked the heart also bears a child on the same day, and calls him Jonah. As the years pass, Elias and Jonah (played as adults by real-life brothers Christian and Jonah Lees) become the best of friends, but will the Queen let her son, who is next in line to the throne, spend all his time in the company of a commoner? Meanwhile, in the kingdom of Strongcliff, the lecherous King (Vincent Cassel) is peering out his window one morning when he hears a maiden singing, ever so beautifully, in the streets below. Though she scampers away before he can get a good look at her, the King, now smitten, immediately visits the woman’s cottage and declares that he must have her. But this cottage is not the home of a gorgeous maiden; in fact, two elderly sisters, Dora (Hayley Carmichael) and Imma (Shirley Henderson), reside there. Anxious to be a royal consort, Dora (who was the one singing) convinces the king, without ever opening the door, to come back in a week, at which point she will allow him to kiss her finger. Dora then spends the next seven days trying everything from magic to make-up to make herself appear younger, but to no avail. And when the king returns, and asks her (again sight unseen) to visit him in his chambers later that night, Dora agrees, but insists that the room must be dark before she arrives. Will her grand ruse fool the king? The third and final tale takes place in the kingdom of Highhills. Princess Violet (Bebe Cave) loves her father the King (Toby Jones), but he is more interested in his new pet: a small flea that he secretly keeps in his bedroom. Over time, the flea grows to an enormous size (as big as a large dog), and, unable to breath properly, dies. Meanwhile, Violet, who is now of age, requests that her father allow her to marry. Having just lost his beloved pet, the king is not ready to part with his only child as well, and, in the hopes of keeping Violet with him forever, he has the flea skinned and says he will only let her wed the man who can identify what creature the hide came from. Suitor after suitor fails the test, but to both Violet’s and the King’s horror, a dreadful ogre (Guillaume Delaunay) manages to solve the riddle. Will Violet live happily ever after with her new “husband”, or will fate intervene on her behalf? 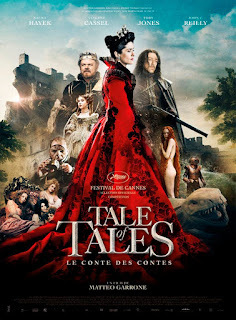 Across the board, the cast of Tale of Tales does a fine job (I was especially impressed with both Hayley Carmichael, who plays the aged Dora; and Bebe Cave as Violet, whose hopes for a handsome husband are quickly dashed). But it’s the manner in which director Garrone brings this marvelous world to life that makes the film such a delight. By seamlessly merging fantasy with reality, Garrone accomplishes in live action what Disney had done in animated movies like Cinderella and Beauty and The Beast, and sets the tone for what’s to come in the very first sequence, with a queen who is unable to conceive (a real problem for some) and a king fighting an undersea monster (a bit of fantasy that is also one of the film’s most memorable scenes). All three stories in Tale of Tales are fantastical in nature, and designed to reflect such human foibles as lust (the King of Strongcliff, driven by his carnal desires, is eager to have his way with a woman he’s never met simply because he liked her singing voice); jealousy (the Queen of Longtrellis doesn’t like the fact that her son prefers a common villager over her); and selfishness (The King of Highhills doesn’t want to be left alone, and tries everything in his power to keep his beloved daughter by his side). Some of the special effects that Garrone employs throughout Tale of Tales are clearly practical (the oversized flea, for example), and they look great. But even those moments that are CGI (such as the sea monster) are strong, convincing us that we’re watching honest-to-goodness fairy tales play out before our eyes. And while most anthologies feature one or two segments that are better that the rest, I can honestly say that I found all three stories in Tale of Tales equally as enthralling. Tale of Tales may not be the cinema’s first live-action fairy tale (Douglas Fairbanks Sr’s Thief of Bagdad is a brilliant film, as is Cocteau’s Beauty and the Beast), but it’s certainly one of the most visually striking, and while some elements may be a bit much for younger children, older kids and their parents will likely enjoy what they see. Just an awful film all around. I tried to watch it because it has John C. Reilly in it. Alas, its level of suckage was so powerful that it actually impelled to to stop watching about 20 minutes into the film with a vow never to allow it assail my senses again.